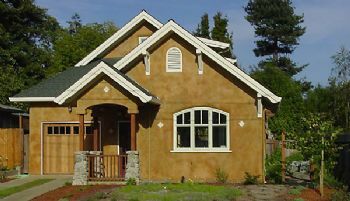 Strawbale (SB) house construction began a resurgence in the United States in the 1980s, but little was known about its structural and thermal properties. Tuscon, Arizona, under the leadership of David Eisenberg of the Development Center for Appropriate Technology, adopted the first SB code in 1996, with California offering the first state-wide SB model code the same year. But those codes offered little insight into the thermal properties of a building material and building system which was highly variable (unlike manufactured insulation products). Among other things, the actual thermal performance of a SB wall depends on the bales’ straw type (rice, wheat, etc. ), density, moisture content, uniformity, and orientation (laid with the wide dimension flat or on edge). Furthermore, the as-built wall’s performance would depend on how closely packed the bales are, how well joints and voids are filled with loose straw, how air-tight the entire assembly is, and how much and what kinds of plasters or other finishes are applied. The thermal performance will also be effected by the use of steel stakes or metal banding to tie the bales together, or threaded rod penetrating the bales from foundation to roof as a tie-down, or by the common practice in New England of using straw bales as infill between, or outfill behind, timber frame posts and braces, which creates substantial air-sealing challenges because it interrupts the interior plaster air barrier with dimensionally-unstable wooden members. To answer these questions, intrepid researchers began to perform heat transfer tests. The first formal test was performed by Joseph C. McCabe in 1993 at the University of Arizona Environmental Research Laboratory as part of his master’s thesis. He used a single bale of wheat straw, at 8.3 pounds per cubic foot (pcf) density and 8.4% moisture content, and used a guarded hot plate to determine an R-value of 54.74 for a 23″ wide bale and R-50.33 for the bale laid on its 16½” edge. This showed an R per inch of 2.38 parallel to the straws and 3.05 perpendicular to the straws. Another test, performed in 1994 at Sandia Lab by R.U. Acton, of an unknown type bale at 5.2 pcf density and unknown moisture content, showed R-44.06 for a 16.5″ bale (or R-2.67/inch). These figures were quoted in a 1995 straw bale article in Architecture and in DOE’s 1995 publication “House of Straw”, in The Straw Bale House by Athena and Bill Steen, David Bainbridge and David Eisenberg (1994), and in an article on “Straw: The Next Great Building Material” by Alex Wilson in Environmental Building News, May/June 1995. In their 1994 book, Build it with Bales, Matts Myhrrnan and S. O. MacDonald ascribe R-40 to R-50 for bale walls. All the literature up to early 1996 seemed to rely on the one or both of these tests of a single straw bale, combined with the “gut feeling” of SB builders that a thick bale provided exceptional insulation – with Gail Brager of UC Berkeley in 1996 assuming as much as R-65, based on “common knowledge” of the straw bale community. In 1995, Watts, Wilkie, Thompson and Corson performed an in-situ test on a SB house in Nova Scotia on behalf of the Canadian Society of Agricultural Engineering, with a wall assembly thickness of 18.4″ and, using both a hot plate and thermocouples, found an as-built R-value of 1.48 per inch, which was only 55-60% of the results from previous tests on bales alone. 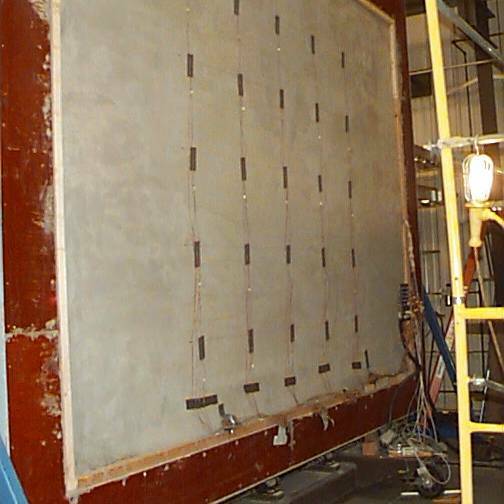 The first laboratory test, using American Society of Testing and Materials (ASTM) standards, was performed in 1996 at the Oak Ridge National Lab (ORNL) and reported R-16.92 for an 18″ wall assembly, or less than R-1 per inch. It was concluded that air convection behind the interior drywall contributed to the surprisingly low readings, and analysis determined that a more air-tight double-plastered SB wall should test about 60% higher, or about R-1.5/inch, which is in remarkable agreement with the Novia Scotia in-situ test result. In the meantime, the California Energy Commission (CEC) and Architectural Testing Inc. conducted laboratory testing of SB wall assemblies in 1996/97 and came up with results of R-1.13/inch (flat) to R-2.06/inch (on edge), though those test walls were found to have high residual moisture from plastering and low-density loose straw at the top to compensate for wall compression. 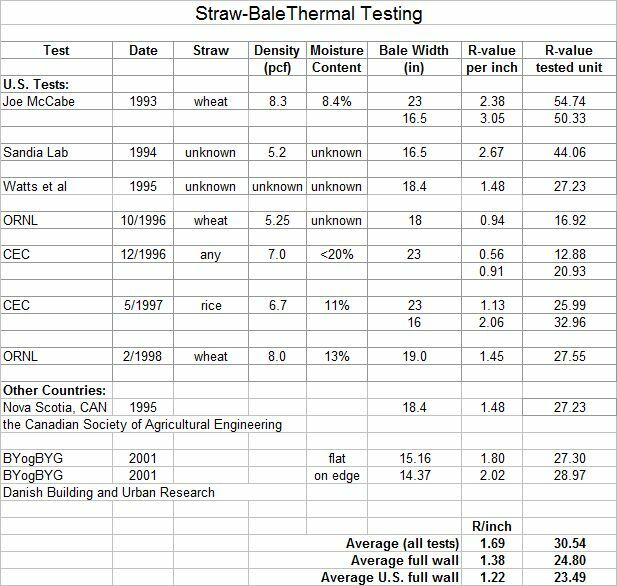 These results and the previous history of SB testing were described in the article “R-Value of Straw Bales Lower Than Previously Reported” in Environmental Building News in 1998. ORNL did a follow-up test in 1998 to eliminate the several deficiencies of their earlier test and had nationally-recognized SB builders assemble 2-string flat bales, stuccoed on both sides, which was allowed to dry for 2 months, and then to equilibrate in the hotbox for two full weeks. This test, using a guarded hot box to ASTM C-236 specifications, is widely considered the gold-standard of all testing to date, and showed R-27.55 for a 19″ wall, or R-1.45/inch. The best overview of SB thermal performance testing is the report “Tested R-value for Straw Bale Walls and Performance Modeling for Straw Bale Homes” by Tav R. Commins & Nehemiah I. Stone, California Energy Commission (CEC), published in the August 1, 1998 Proceedings of the American Council for an Energy-Efficient Economy (ACEEE). The California SB code has adopted the R-30 value as the standard. That’s 50% better than the IECC prescriptive requirement for climate zone 6 (northern New England), but 33% to 40% less than what had been assumed by SB proponents and what had become the minimum standard in North America for super-insulated homes since the late 1970s, and only about 50% of the much newer Passive House standard. Here is a summary table of test data. Ironically, Nehemiah Stone, energy consultant and charter member of the California Straw Builders Association, who co-authored the report presented to ACEEE which recognized the 1998 ORNL test as the definitive statement on SB wall R-value, wrote an article in 2003 for the Ecological Building Network, “Thermal Performance of Straw Bale Wall Systems“, in which he attempted to sidestep the poor test results by suggesting that ASTM laboratory hot box tests offer only an “estimate” of R-value, that the thermal mass benefit of SB walls “will make a building wall with a good R-value act like one with a superb R-value”, and that there are diminishing returns with increasing R-value such that “the long running debate about whether the true R-value is around R-35 or R-45 or R-55 becomes pointless (if not empirically meaningless)”. The ASTM C236 (superseded in 2001 by C1363) guarded hot box test is the recognized industry standard for determining steady-state heat flux, and hence resistance to heat flow or R-value, of non-homogeneous building panels or assemblies, and is similar to ASTM tests on homogeneous insulation materials that are uniquely recognized by the Federal Trade Commission for labeling insulation materials or in advertising promotions, called the R-Value Rule (16 CFR Part 460) “Trade Regulation Rule Concerning the Labeling and Advertising of Home Insulation”. So, while it’s true that such a mock-up wall test is only representative of the variety of similar wall constructions, it results in a scientifically accurate measurement, not an “estimate”. As for the benefits of thermal mass, that’s been well-established and quantified, also by ORNL in 1995 as the Dynamic Benefit for Massive Systems model (DBMS), and the thermal performance improvement depends on local climate, thickness and location of the mass relative to insulation, as well as other factors. The DBMS R-value multiplier factor can range from a little more than 1 to nearly 3, but exaggerated claims without quantification or application to a specific climate are meaningless at best. In some circumstances, excess thermal mass can become a liability. Finally, the argument for “diminishing returns” is commonly misused by manufacturers, installers, retailers and in advertising claims by those offering products that cannot meet the high thermal standards that both codes and best building practice are fast moving towards. To suggest that the difference between R-30 and R-40 or R-60 is “empirically meaningless” is either expressing ignorance of the thermodynamics of building systems or simply misleading. I have been designing and building homes with minimum R-40 walls and R-60 ceilings for 30 years, and the latest Passive House approach for cold climates requires something on the order of R-60/R-100. Whether those extremes are justified on either financial or environmental levels is debatable, but there is no debate that envelope heat loss is inversely proportional to R-value (though other factors, such as air exchange rates, are also critical). While the kinds of disclaimers and sidestepping that Nehemiah Stone resorted to in his 2003 article are not uncommon among straw bale construction practitioners and advocates, and all-too-common for certain commercial products in a highly competitive industry, it appears that even the most green of all builders, within the “natural building” community, are not immune from letting their dedication to materials and methods override the facts and physics as we know them. There are plenty of sound reasons for using such eminently renewable and low-footprint materials as straw bales and earthen plasters, even if superior thermal performance is not one of them. If you place a 4 mil plastic sheet underneath the drywall and kept the siding fairly air tight, you would create a dead air space with an R rating higher than what our crap government rates for straw. Is not Empire USA a rich man’s paradise? First, a plastic vapor barrier causes far more harm than good, except perhaps in the most extreme cold climate zones (it’s still code required in Canada). Second, a 4″ deep vertical dead air space with high to moderate emissivity surfaces would provide between R-1 and R-2 (not the R-30 of straw bale walls), and would create strong convective loops that would act as a “heat pump” to move interior surface heat to the exterior sheathing. The “Empire USA” has no relevance to this topic. I think you are too quick to dismiss Stone’s observation of true R-value being “empirically meaningless”, and you seem to fall into the common mistake of treating R-value and thermal mass as synonyms. The hot-box tests measure the time for directly applied heat to travel through the wall (R-value), but a two-week test doesn’t reflect the equalizing that occurs within the straw bales over the course of several months (thermal mass). Another seemingly underperforming material, adobe is typically rated as having a dismally low R-value (R-8 for 15 inch walls), yet adobe buildings repeatedly prove to maintain internal temperatures in the low 70’s throughout the Southwestern summer months, and in areas with winter temps that stay below freezing for months, similar results are seen. It’s this ability to hold the heat for months and equalize it that makes the true R-value of a given SB wall relatively unimportant, as long as moisture content, density and thickness guidelines are followed. There is plenty of controversy in the R-value rating system itself, especially in comparing fiber insulations to solid wall materials and insulations. (See https://www.cufca.ca/docs/R-Value%20Fairy%20Tale.pdf; not highly scientific, but he illustrates the point.) You might want to research actual results of completed SB homes and how they perform over the course of a year, versus focusing purely on one test and number. You exhibit a profound ignorance of thermodynamics, both in building materials and in whole building assemblies and systems – a subject I taught at the post-graduate level. I was also the technical editor of a book on natural building (and another on building science), which detailed the empirical results of studies of a dozen Northeast straw bale homes that had been occupied for a number of years. I most certainly do not confuse R-value (which is NOT controversial to those who understand the test protocols) with thermal mass – two related but profoundly distinct qualities of materials and structures – and nothing in any of my essays here would give that impression, except to one such as you who has such a sophomoric understanding of these issues as to lead only in confusion. I will not bother to address each element of your misguided comment, but merely encourage you to substitute the mythology you have imbued with authentic education in the science and performance of thermodynamics in building systems.